Great, casual restaurants with outdoor seating. The best places to get a full late-night meal. We're getting older, and so is the idea that Brooklyn is the epicenter of New York cool. Sorry, Williamsburg, you gave that up when you got a 16 Handles. But Five Leaves has been a hipster hangout since the moment it opened in 2008, and it remains so, even despite the fact that there are now endless nearby options for people who want to look good at a dinner table and also maybe eat something. The initial Infatuation review of Five Leaves came very late in the game - at least according to current internet judgment protocol. Our first visits came in late 2011, and by the time we'd had a few meals here, we had firmly decided that it wasn't deserving of all the hype. It was too uncomfortable, too inconsistent, and too full of people that spent a good part of their morning rolling up the sleeves on their t-shirt. Fast forward to present day, and we've been back to Five Leaves a few more times, just to see what's shaking. We still don't love the food as much as some people seem to, and it can still be very cramped and crowded. But we will say that the consistency has improved - a lot. Brunch is and always has been the best time of day to eat here, but dinner can be a good move too, assuming you know what to order and most importantly - that you can be patient with the scene around you. Then again, I'm writing this from the perspective of someone who is more interested in the eating that goes at Five Points than in the hanging out that goes on at Five Points. If you're 23, just got a job at Condé Nast, and have yet to taste a truffle fry, bump up this rating considerably. You're gonna love it here. Possibly the best thing on the brunch menu, because pancakes are awesome. A really good egg sandwich, served with a side of spicy tomato jam, which is slammin'. The only downside - it's really messy. Eggs, hash browns, toast, and some sausage and bacon. A proven hangover cure, according to unnamed and unaccredited scientists (us). A mound of kale in a spicy anchovy dressing with hazelnuts, that's sprinkled like snow with grated Gouda cheese. This is good, but how many forkfuls of kale can you really ingest in one sitting? Four? Maybe split this. We've never been crazy about the oyster selection, or quality of shucking that goes on at Five Leaves. Get your oyster fix somewhere else. If you must do oysters at Five Leaves, this is how to do them. Served on the half shell with smoked chili aioli and cucumber relish, both of which add some nice texture and flavor to the oysters. OK, we'll admit it. The burger is pretty damn good. If you find yourself at Five Leaves, you'll want to be eating this. And don't be afraid of the fact that it's got a fried pineapple ring, pickled beets, harissa mayo, and a sunny egg. All that crazy sh*t works together quite well on this monster of a burger. Not a terrible option, especially if you're looking for something easy. That said, if you want a serious steak, you want to be at St. Anselm. Selamat Pagi is a Balinese restaurant in Greenpoint that will make you feel like you’re on vacation. 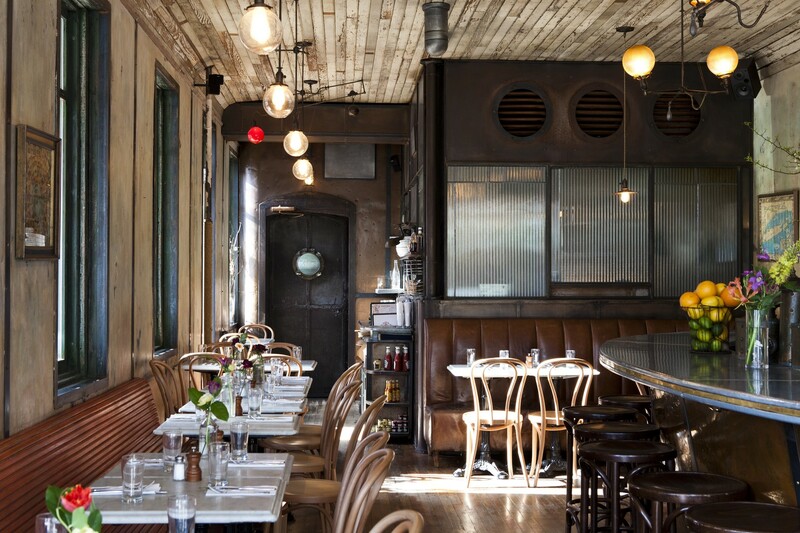 Esme is our favorite brunch place in Greenpoint.